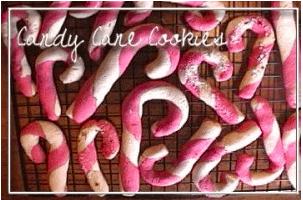 We grew up making these candy cane cookies every year for Christmas. 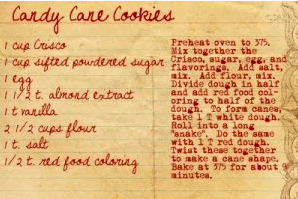 I think the original recipe came out of that old Betty Crocker Cooky Book. (NOT the newer version called the Cookie Book.) We’ve changed it up a little over time to make it ours. BTW, I took these photos YEARS ago before I even had a blog so sorry for the small size and the poor quality. I’m going to take more pictures next time we make them. Mix together the Crisco, sugar, egg, and flavorings. Add salt, mix. Add flour, mix. Divide dough in half and add red food coloring to half of the dough. To form cane, take 1 T white dough. Roll into a long “snake”. Do the same with 1 T red dough. Twist them together to make a cane shape. Bake at 375 for about 9 minutes. I always thought it was interesting that this recipe calls for almond extract instead of peppermint. We’ve made them with peppermint but there’s just something about the almond extract that reminds me of Christmas! Also, you might be able to see in the TINY photo that we also crushed up some peppermint sticks and sprinkled them on top. Almond Joy Cookies – Only 4 Ingredients!!! I remember those cookies. I didn't think they tasted very good! I have made these candy cane cookies for over 40 years. If my grown children and grands didn't have these at my house on Christmas Eve, they would KNOW something was wrong. In fact, I am making them next week for a movie night with a couple or three friends. Thought they might like them, too…. Oh my, I'm definitely borrowing this recipe! Anything with almond extract in it has got to be good! I've had these–they're very good! Thanks for sharing such a wonderful recipe! OH MY GOSH! I remember these from that same cookbook! Thanks for the trip down memory lane…when I at mom's for our cookie bake, I am going to dig that book out, I know she still has it!